Echidna. Photo by Dr. Lloyd Glenn Ingles © 2001 California Academy of Sciences. There are only five living monotreme species: the duck-billed platypus and four species of echidna (also known as spiny anteaters). All of them are found only in Australia and New Guinea. Monotremes are not a very diverse group today, and there has not been much fossil information known until rather recently. In some ways, monotremes are very primitive for mammals because, like reptiles and birds, they lay eggs rather than having live birth. In a number of other respects, monotremes are rather derived, having highly modified snouts or beaks, and modern adult monotremes have no teeth. Like other mammals, however, monotremes have a single bone in their lower jaw, three middle ear bones, high metabolic rates, hair, and they produce milk to nourish the young. Read about monotremes at the University of Tasmania, who have one of the best sites on the web about living monotremes. Try the University of Michigan's Animal Diversity Web for more information about living monotremes. 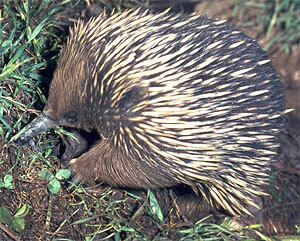 The Tasmanian Mammals page includes distributional information on monotremes.